Current Status: Planting is complete and plants will continue to become established. 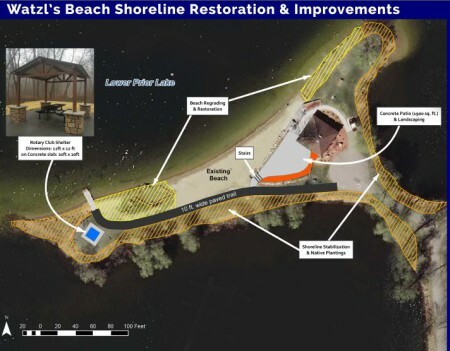 The City of Prior Lake has plans to make future improvements to the beach area and will continue to maintain the shoreline restoration area. 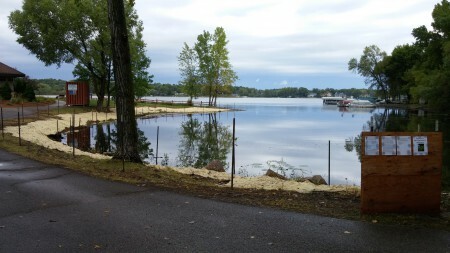 Shoreline buffers are one of the best management practices identified in the Lower Prior Lake Implementation Plan. 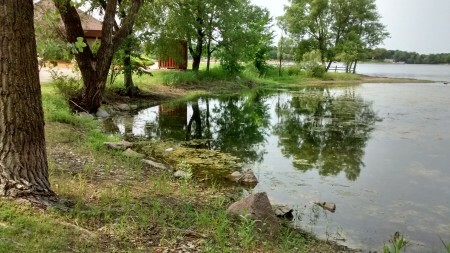 The shoreline restoration at Watzl’s Beach combines the efforts of both PLSLWD and the City of Prior Lake to reach the water quality goal of this subwatershed. 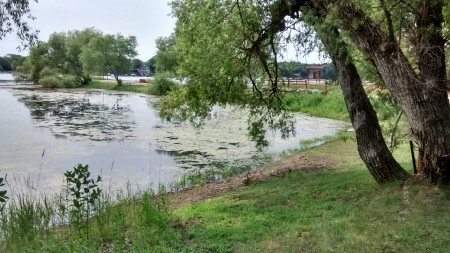 Watzl’s Beach is located on the southern end of Lower Prior Lake and is part of Lakefront Park, Prior Lake’s flagship city park. The shoreline area at Watzl’s beach was previously dominated by invasive plants and erosion was occurring at the shoreline. As such, the site was in desperate need of restoration. 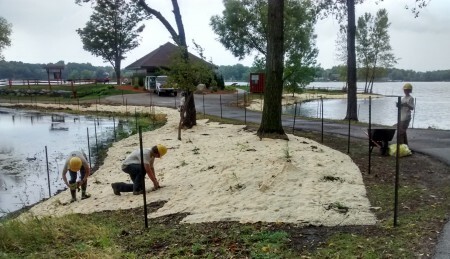 Staff from Prior Lake’s Parks Department and a Minnesota Conservation Corps (MCC) crew both contributed to the prep work of the site. The shoreline was first raked and tilled. Then two different native seed mixes were spread and a netless erosion control blanket with biodegradable pins was installed. Finally, the MCC crew began planting over 1,300 native plant plugs which two energetic volunteers and a few City and Watershed District staff finished planting. The native plants will provide food and habitat for wildlife and their deep root systems will help stabilize the shoreline. The entire project area is currently surrounded with temporary anti-goose fencing, as our winged friends love to eat native seedlings. The posts and fencing will be removed next year after the plants have been established. Long-term maintenance will include periodic mowing to stop weed species from invading our new native shoreline buffer. The maintenance plan may also include spot spraying invasive species and prescribed burning, among other practices.